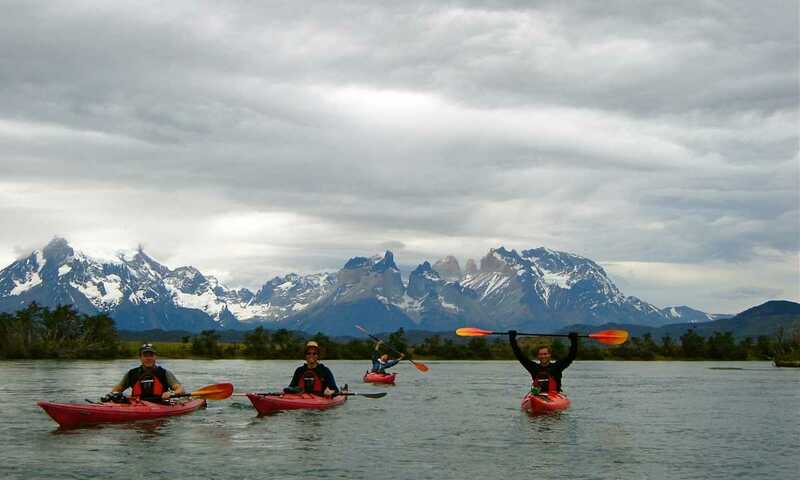 For experienced paddlers, a 4-day kayaking trip in the more unusual parts of the Torres del Paine National Park. You'll paddle right up to two of the parks glaciers and to a big rapid/waterfall. You will also hike to the remote Geyke Glacier. Camping each night and an authentic lamb BBQ on your way home! 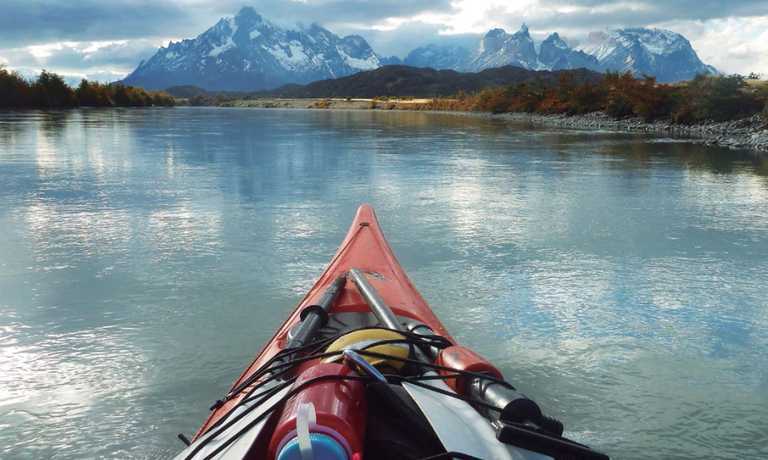 Transfer from hotel, paddle on Lago Grey and descend the Grey River, views of Paine massif. Trek to the Geike’s Lake and Glacier, kayak last section of the Serrano paddle close to Serrano Glacier. Paddle in the Serrano iceberg lagoon, enjoy an authentic lamb BBQ at a ranch. Day 1: Pickup at your hotel in Puerto Natales or Torres del Paine. Your trip will begin at Grey Lake sector, here we will prepare and distribute the kayaks and begin with the safety and paddling instructions. Our guides will help to recommend the appropriate equipment you will need to take during the trip and the rest of your luggage will be taken directly to Puerto Natales and will be stored in our office. Once at the Grey Lake area we will carry the kayaks approximately five minutes to the beach on Grey Lake. 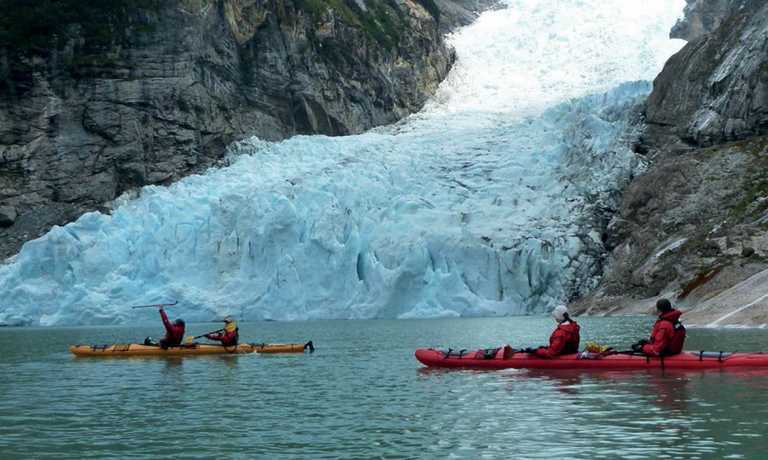 We will have three hours to enjoy the magic of paddling around the icebergs that have broken away from the glacier and we will be in awe at the unique views of the Paine mountains and their impressive granite walls. After we have seen the icebergs we will have a short stop for a lunch before we continue with our adventure. 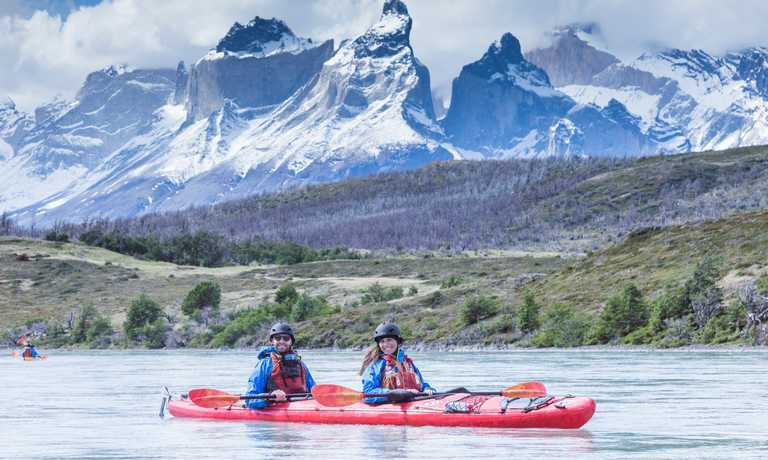 We will have a relaxing time paddling the kayaks down the Grey River, enjoying the unique views of the Paine mountains in all their splendor. The experience will finish where the Grey River meets with the Serrano River. This day starts with one-hour paddling across the first section of the Serrano river, this is a calm zone and gives us the opportunity to see and assess the level and comfort of kayakers during paddling. The first team activity will take place on arrival at a small waterfall in the river and we will carry the kayaks roughly 100 meters. After that, we will continue paddling alongside National Parklands & privately owned lands and in these, we will see the typical cold forest vegetation of Magallanes & the associated fauna. We will also be able to observe from a distance, the glaciers of the Southern Patagonian ice field. At the end of the day, we will arrive at Anita ranch. The Guerrero family will receive us to camp on their property. Today we will hike for 8 hours (round trip) to Geyke glacier. From here we will enjoy the view of the giant Icebergs floating in the lake. During the afternoon return to Anita ranch. Today we will continue paddling Serrano river until the encounter with the "Ultimo Esperanza" fjord which always offers a touch of adrenaline due to its vast waves. Finally, we will arrive at Puerto Toro (Bernardo O'Higgins National Park), our camp base here is located in middle of the forest with a beautiful view of Serrano glacier. With an early start, we will carry the kayaks 100m to the lagoon of the Serrano glacier so that we can paddle in & amongst the icebergs until 11:00 am, we will have enough time to pack away the camp, before boarding the boat, which departs at 13:00 (either the 21 de Tonina catamaran). We will stop off in a local ranch to enjoy a farewell BBQ. Arrival at Puerto Natales will be 18:00 hrs approx. This trip can run as a group trip, with prices starting from $1,829 per person for a complete group. If you are looking to join a group or you are a solo traveller we will help to form likeminded groups of travellers. Please let us know your travel plans. Price of trip is USD $1829 per person for groups of 2 people, $1370 per person for groups of 4 people and $1255 per person for groups 6 people. Please get in touch for more details.